Padraic Glynn, owner and chef of MPG Foods. Padraic Glynn is the owner and chef of MPG Foods in Claregalway, a HSE approved kitchen which he set up some years ago. His love of quality food originated from growing up on a family farm which supplies fruit and vegetables for the local hotels and restaurants. 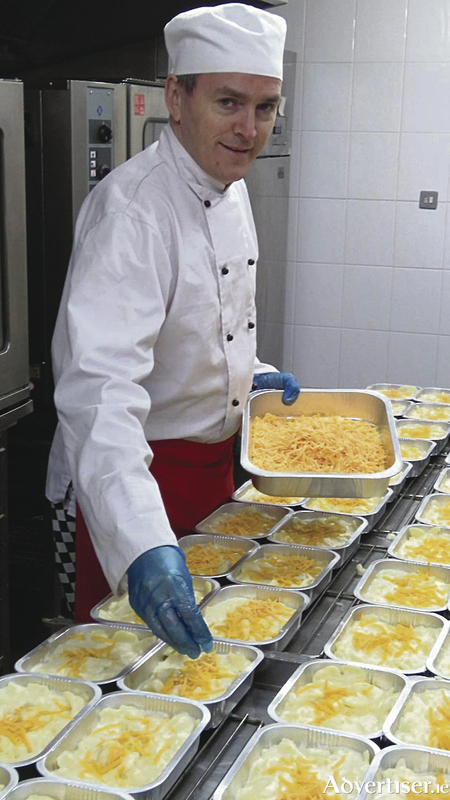 Mr Glynn trained as a chef at GMIT and qualified more than 25 years ago. He has a vast experience in the food and catering industry, having worked in award winning restaurants in the west of Ireland and in the USA. He takes great pride in using only top quality ingredients in his dishes, some of which are gluten free. Many of his products can be found in various outlets throughout County Galway and nationwide; these include Tormey Butchers; McCambridge’s; Hughes’ SuperValu, Claregalway; Brady’s Butchers, Athenry; McGrath’s Butchers, Mervue; Glynn’s Centra, Carnmore; Joyce’s Supermarket; and Dunne’s Stores nationwide. Mr. Glynn’s dishes are also available to order for home parties including Communions, confirmations, birthdays, christenings, special events, etc. The delicious handcrafted home cooked dishes to choose from include: beef or vegetarian lasagne, beef Stroganoff (GF ), chicken a la king (GF ), chicken curry (GF ), chicken sweet and sour (GF ), garlic and cheese potatoes, and cooked rice. The dishes are made to order and delivered directly to your door. All that you have to do is heat them up in the oven. You can also freeze all the dishes for future events.